Greetings again from the darkness. More than 50 years after his death, President John Kennedy casts an ever-present shadow over Lyndon Baines Johnson’s career as a stellar politician and a President with significant accomplishments. Part of the reason is presentation – JFK was a story book leader straight from the fashion magazines, while LBJ was a vulgar-at-times comic book adversary who looked and talked funny. Each has been portrayed on film numerous times and from various perspectives. Woody Harrelson and his facial prosthetics play LBJ, and Mr. Harrelson seems to be enjoying the swagger and emotional range of the titular man. What this film does that’s a bit different from others is embrace the comedic elements – enhanced by both the performance and the script from Joey Hartstone. It seems odd (a somewhat awkward) to have so many laughs in a movie where the infamous 1963 Presidential motorcade, and subsequent assassination, form the backdrop. Director Rob Reiner presents LBJ in all his crude and gruff glory, but also shows the ultimate politician – a man who was constantly negotiating. Intimidation was always part of the LBJ motif, and the film effectively displays the tactics used by John and Bobby Kennedy (Jeffrey Donovan, Michael Stahl-David) to take the wind out of LBJ’s sails after the election. There are reenactments throughout the film that place us back in the middle of iconic images seared into our memories … the motorcade after the shots, the scene at Parkland, and the swearing in aboard Air Force One with Jackie still wearing her blood-stained Chanel suit. This was an incredible time in our history, as the nation was emotionally shattered. It’s for this reason that much of the film seems disjointed or misguided. 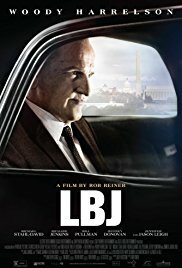 Too much (or maybe not enough) attention is on LBJ’s strained relationship with Georgia Senator Richard Russell (Richard Jenkins), one of the most racist men we’ve seen on screen. Their discussion of race relations while being served dinner by the black woman is beyond uncomfortable – yet still somehow too stagey. Most of the film is spent on LBJ’s time as Senator and Vice President, with only the final act being about his famous networking upon ascending to the Presidency … after which the entire focus is on the Civil Rights Act. The flow of the film seems a bit off, though most will enjoy watching Harrelson’s performance – especially when paired with Jennifer Jason Leigh’s Lady Bird. Together, the two almost rescue the script. This entry was posted on Thursday, November 2nd, 2017 at 8:10 pm and is filed under Drama. You can follow any responses to this entry through the RSS 2.0 feed. You can leave a response, or trackback from your own site.